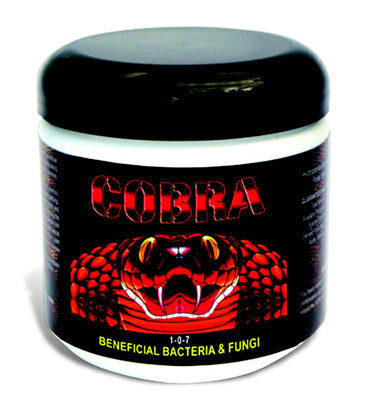 Cobra is a combination of several different beneficial bacteria and fungi species, which assists plants growth by stimulating a larger root mass and correcting nutrient imbalance. Cobra works by colonizing plant roots and extend the roots system into the surrounding soil, greatly enhancing the absorptive surface area of roots system, forming as essential link between plant and soil. Also included in this specially formulated product are vitamin B1, soluble kelp and Humic Acid so the plant can enjoy improved nutrients and better uptake of water. You will agree that Cobra is the most effective, high quality product in the marketplace, creating optimum growing medium and plant growth conditions or we’ll give you your money back.